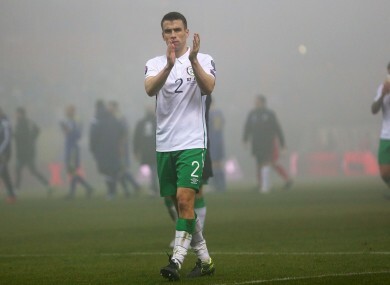 Coleman salutes away fans at full-time. SEAMUS COLEMAN ACCEPTS Ireland’s 1-1 draw in Zenica was a good result, but he can’t help feeling that it may have been a missed opportunity. Only five minutes remained on the clock when Edin Dzeko cancelled out Robbie Brady’s solo effort to leave the Euro 2016 play-off evenly-poised — although Martin O’Neill’s men do hold the slight advantage of an away goal. “We probably would have taken a 1-1 draw (before the game) with the away goal,” Coleman told reporters after the game. “Don’t get me wrong, we’re not overly-disappointed and we have to be positive going into Monday but we’re slightly disappointed to concede so soon after scoring. They are a threat and they have got good players so we have to prepare again, get the bodies right and look forward to Monday. With John O’Shea absent, Ciaran Clark deputised at centre-half alongside Richard Keogh and the Aston Villa defender came in for praise from manager Martin O’Neill after keeping Edin Dzeko and Vedad Ibisevic quiet for much of the game. “They had a lot of possession in the first half and put plenty of balls into the box,” said Clark. “They created a couple of decent chances where they could have possibly scored but thankfully for us they didn’t go in and we managed to get the first goal. The 26-year-old had to time his interception perfectly in the second half to cut out a cross with Roma striker Dzeko ready to pounce. His partner Keogh was unable to get his toe to a similar ball late in the tie, however, as the Bosnian captain pulled them level. “As a defender, you’ve just got to try get something on it and so many balls like that go flying into the back of the net,” he said. “Thankfully for me, Darren (Randolph) was able to just scoop it up but it was a pretty heart-stopping moment. Email “Coleman and Clark staying positive despite the disappointment of conceding a late goal”. Feedback on “Coleman and Clark staying positive despite the disappointment of conceding a late goal”.